After having a rocky archery season which ended without harvest but with a high note, I regrouped and looked forward to the rifle season. I had film jobs going throughout the first few weeks of November, so my elk hunting was going to have to wait until the end of the month. With the last week of November upon me, I began my search. Bursting with ambition and physically refueled, I began routinely strapping on my Crew Cab day after day loaded with all the hunting necessities including my video camera and tripod. Miles were being logged and no bulls were to be found. I couldn’t believe it. I had hunted as hard as I could throughout the fall for elk and just couldn’t seem to put anything together. The days and miles sucked into my Crew Cab were running together. Being tired was only part of it, physiologically I was waning because of the old saying I stand by, “what you put in is what you get out!” Well, I knew that I had put in a ton but was definitely not getting anything out. I couldn’t find a nice bull no matter how far I hiked or long I glassed. I decided to change areas and game plans because obviously my current spots weren’t paying off. I decided to sit back and rest for an evening and just glass, hoping to find a batch of good bulls showing themselves right at dark. I didn’t see any bulls and not even one single cow!? I did take notice of a few sets of tracks way up high in the deep snow moving through what historically was a travel corridor for bulls. Going off this tiny bit of info, I shaped the next mornings plan. An early start would be needed if I ever wanted to glimpse any of the bulls making those tracks. I would have to try and intercept them… if they were even up there in the timber of the high benching pass. I left the truck the next morning with the realization that this was going to be a big day. I never dreamt how big it would become. After 2 hours of stiff hiking in a steep black timbered slope, I was slowly approaching “the zone”. It was approximately 15 minutes before legal shooting light when I hooked into the tracks. They were bull tracks, six of them and moving up and away from the wave of people they were so accustomed to eluding. I followed the tracks, slowly sifting through the knee deep snow only now taking notice that I was approaching 9000 feet . I had followed the tracks about 500 yards paying close attention to their shuffle-shuffle-eat routine written in the snow. Pushing slowly along ready for anything, I caught a visual. I shifted to my left about ten feet and laid down where I had a clear shooting lane ready. They were all bulls, I could see 2 of them as they walked through my lane, both being small 6 points. I kept looking and another bull appeared moving left to right, he was also a small 6 point, not what I was after. I kept searching, and BAM, from out behind a huge douglas fur tree stepped the bull. I could make out he was very heavy with extra stuff and that was all the convincing I needed. I patiently waited for him to open up into a lane so I could get a shot. Crack, the first shot hit it’s mark from about 150 yards through the timber. I proceeded to follow up on him with a few more insurance shots and the great bull finally toppled. 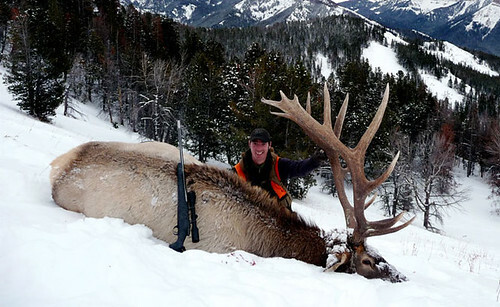 Tyler Johnerson with his hard-earned 2008 Montana elk. What an awesome bull, what a long season, I was overwhelmed with emotions. After taking in the moment and snapping a few pictures with the timer, I went to work on the beast. I prepped the bull for packing him out, loaded up the head, cape and horns and headed down still running on adrenaline. The heavy massive horns carried perfectly. I made it out a little afternoon where I rallied my uncle to come back up and help with the remaining loads. The afternoons revisit to the kill site had turned to nightfall, but by 7:00 p.m. that night we had the bull in the back of the truck. All the hours logged in the mountains this fall cinched into my Crew Cab payed off huge. It’s great to have a pack that can meet every requirement of every aspect of every hunt! I have tremendous confidence trekking the backcountry when I have a great pack. Thanks Mystery Ranch for your superior product. Check out more of Tyler’s adventures at www.huntsoloventures.com.